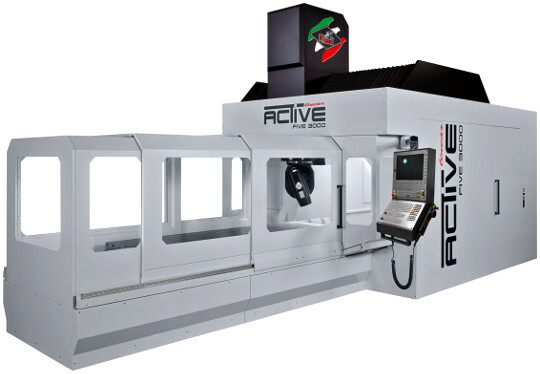 The model ACTIVE FIVE is a high speed working center with fixed portal and mobile table solution characterized by a very compact and ergonomic line. The machine is equipped with a head to two continuous working axes. The planning with the aid of the system FEM has allowed to optimize the calculation to finished elements making the particularly rigid structures of this model with the total elimination of the vibrations in phase of milling. If to this are added the low attritions and the elevated accelerations of the axes, are gotten so all the characteristics that allow to get particularly bright dynamic performances is in finish, that in roughing, to advantage of the economy of the whole cycle of milling.